and Tweed Heads 3 rinks to 0, division 6 lost to McKenzie Park 2 rinks to 1. We are proud to announce that after the final round, three of our teams have qualified for the finals. Congratulations to divisions, 2, 4 and 5. We are very proud of you and good luck in the finals! This will be my last newsletter as Lynsey Clarke will be returning to the office on April 1st from maternity leave. Thank you to everyone for all your wonderful support, it has been a blast! I am sure to see you around the club, but as the Bowls Coordinator, I will say good bye! won on the night plus a visit from the Easter Bunny! Get your tickets early to avoid queuing on the night, with tickets available for purchase at reception now. 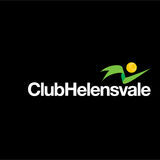 Please remember Club Helensvale is CLOSED Good Friday. Singles Finalists Lynsey Clarke & Magaret Pickering. B Grade Triples Champions, Sally, Christine & Sharon. Experience alone can provide you with a sound basis for shot selection, but there is a guideline that should apply to novices and experts alike. During trial end, when you are trying to establish line and length, you will notice if the rink is two-paced but it may take an end or two to decide which side suits you best, then try to stick to it where possible - one hand one way, backhand the other. As the head develops, there will be situations in which you must play the more difficult side and you should not hesitate to do so, but as soon as possible revert to your favourite side. You will want to settle into the groove with line and length as quickly as possible striving for equal confidence on your forehand and backhand deliveries. Remember that length is more difficult to achieve than line, and because the green will quicken during play you should try to get into the drawing groove immediately so that you can respond to subtle changes in length. When drawing the jack, close can look good, but not all close bowls are equally good, just behind or just in front is ideal, but jack high and just to the side can be a poor result. The jack high bowl is perfectly placed for a rest shot, if it escapes that fate, it could still be left high and dry by a trail shot. It is wise to work on the assumption that it is by winning the majority of close ends that you are most likely to win the game. So develop the habit of keeping things tight from the outset. If you are fortunate to get away to a flying start, by all means press home your advantage, but do not risk squandering that precious lead to do so. The only real exemption to this policy is when you are streets ahead and a big count will get you past the winning post. In such circumstances you are likely to be feeling both aggressive and confident, and it would not be advised to suggest you â&#x20AC;&#x153;throttle backâ&#x20AC;? and coast home. You are to gain enjoyment as well as victory. Just bear in mind, however, that every once in a while you will come a cropper and see that unassailable lead disappear like a mirage. In a match played over a specific number of ends you really should do everything possible to curb any reckless impulse, however much it may go against the grain. If there is a golden rule for the chancy shot, it is this. During the last third of the match, if you are winning, do nothing to jeopardise your position. The pressure is on your opponent, and you should tighten it ruthlessly. If you are losing, look to claw your way back bit by bit, rather than gamble on a dramatic counter strike, although of course that principle should be abandoned if you are running out of ends. 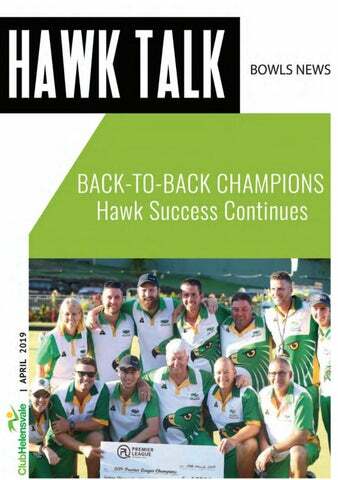 Club Helensvale's monthly bowls magazine.